Pick up & drop off at the Dijon or Beaune train station. 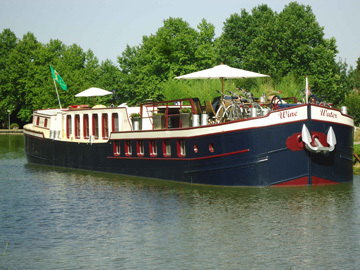 Cruise starts at 45kms West of Dijon and 30kms North of Beaune starting from the small village Vandenesse en Auxois near Chateuaneuf en Auxois, direction Dijon, cruising through the beautiful Vallée d’Ouche. This part of the Burgundy Canal is the most scenic of all the French canal routes with nearby villages & small towns, restaurants and not far from the famous Burgundian vineyards - Côtes de Nuits & Côtes de Beaune. Day 1: Welcome drinks on board, guided tour the barge with the Captain. Welcome evening dinner is served on board. Day 2: Cruise and if wished in the late afternoon visit to a nearby place of interest. 2nd night: the Captain will reserve you a nearby restaurant. Day 3: Full days “Wine, Historical & Discovery tour“ with Max in his air-conditioned mini-van, lunch is reserved in a typical Burgundian restaurant in a famous wine village on the outskirts of Beaune (this is included in the price of the cruise) 3rd night: evening meal on board. Day 4: Cruise and if wished late afternoon visit to a place of interest, early evening the Captain will reserve you a nearby restaurant! Day 5: After breakfast the Captain will drive you to either the Dijon or Beaune train station.